"Strollers aren’t just a common site in the suburbs where single-family houses abound. A growing amount of Toronto residents aren’t buying into the backyard-and-bungalow lifestyle that’s far away from the city centre. In fact, a number of the city’s most vertical neighbourhoods – the Waterfront, the Bay Street Corridor, Willowdale West – are seeing a baby boom. It’s no secret that the waterfront and neighbourhooods along the Yonge-University subway line are seeing a significant population increase as more people move into the new condos. The Waterfront Communities – The Island, an area of Toronto that includes the Entertainment District, St. Lawrence Market, the Distillery District and City Place, had a population of 26,025 residents in 2008 according to City of Toronto data. By 2011, that number ballooned to 43,365, a 66.63 per cent surge. While the neighbourhood may call to mind single city dwellers, the number of children in the area has increased at a similar rate. In 2008, there were 805 kids aged 0 to 4-years old, an amount that rose 60.25 per cent in 2011. 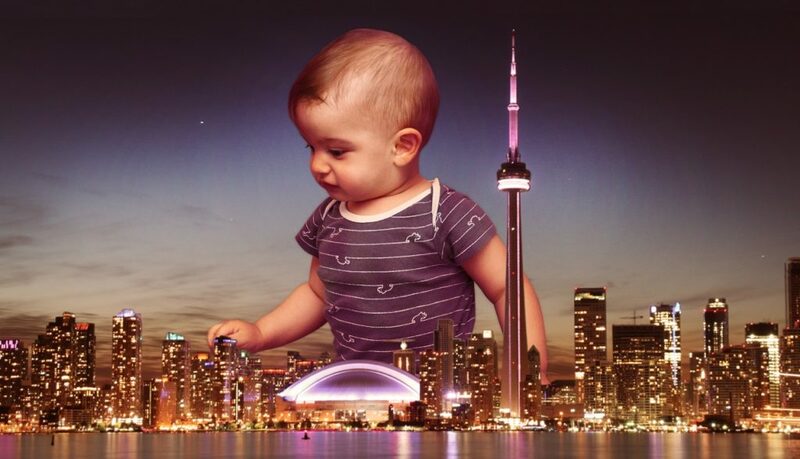 Out of the 140 neighbourhoods studied by the City of Toronto, the Waterfront neighbourhood’s baby boom was second only to the Danforth, which saw an 81.43 per cent increase of the four and under set. The actual numbers, however, were much smaller compared to the Waterfront, with the baby population rising from 350 to 635 in three years. That surge in the daycare crowd was seen in a number of downtown neighbourhoods. The Bay Street Corridor, which calls to mind career-obsessed singles hell bent on getting ahead in business, actually saw a boost in wee children. In three years, the amount of 0 to 4-year olds increased at a rate of 32.5 per cent, while the general population of the neighbourhood rose by 26.27 per cent. Toronto is seeing a growing population of children aged 0-4 in the downtown areas (green), while the number of children in many suburban areas is declining (red). Condos are typically turn-key, which can help if you’re pressed for time and chasing toddlers: there’s no snow to shovel or lawn to mow. Gridlock in the city has made downtown living more attractive to many home hunters, including those starting families and unwilling to give up family time to long commutes between the suburbs and their job in the city. Another perk for the condo-dwelling families? Because so many towers feature a drug store or grocery store at street level, rushing out to buy formula or diapers can be just an elevator ride away. There is also a big economic component to the baby boom in condos. Many families are opting to live with less space in the city due to the growing cost of owning a single-family home. In the City of Toronto, the average sale price for an existing detached house as of May 2015 was $1,115,120. A semi isn’t exactly a bargain either, with an average sale price at $779,523. Meanwhile a condo in the city is much more affordable with an average sale price of $422,947." xOut of the 140 neighbourhoods studied by the City of Toronto, the Waterfront neighbourhood’s baby boom was second only to the Danforth, which saw an 81.43 per cent increase of the four and under set. The actual numbers, however, were much smaller compared to the Waterfront, with the baby population rising from 350 to 635 in three years. That surge in the daycare crowd was seen in a number of downtown neighbourhoods. The Bay Street Corridor, which calls to mind career-obsessed singles hell bent on getting ahead in business, actually saw a boost in wee children. In three years, the amount of 0 to 4-year olds increased at a rate of 32.5 per cent, while the general population of the neighbourhood rose by 26.27 per cent.